The theme of his S14 is Strike Witches, which is basically a series based around WWII fighter planes anthropomorphised into teenage girls who have to fight an enigmatic alien enemy by using Striker Units, which are like magic-powered aeroplane engines they wear on their legs. This character, Erica Hartmann, has a Striker Unit is based on the design of the Messerschmitt Bf-109, and she fights with a handheld MG 42. Her name is based on Erich Hartmann, an actual Third Reich fighter ace. The reason none of them wear pants is because the Striker Units need to be in skin contact for the magic to work, and since the girls are always on call to fight, they can’t wear pants. Convenient, eh? Sukumizu and tsuraichi. I like it. OK, let’s take this even further now. Hayate the Combat Butler! Whenever K-On! 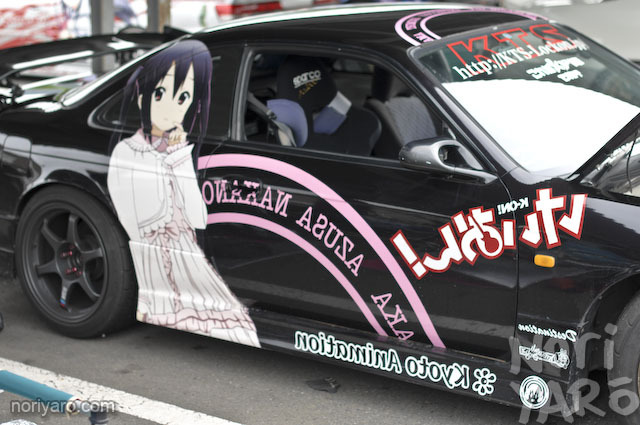 goods go on sale, it’s either Mio or Azunyan that sell out first. 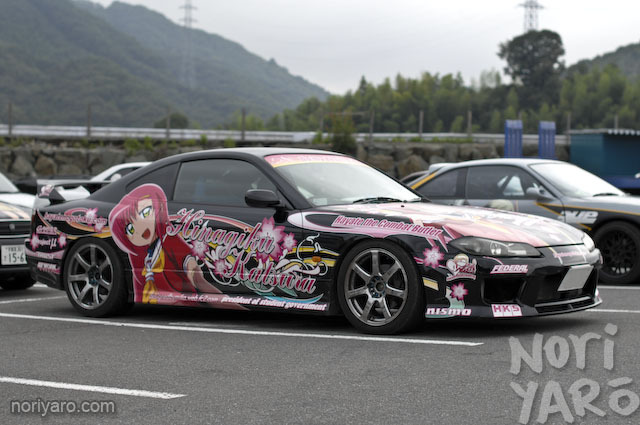 I’m pretty sure you couldn’t get away with this in any country other than Japan. Here’s a useful word in Japan: zettai ryouiki. Actually, it’s not that useful. 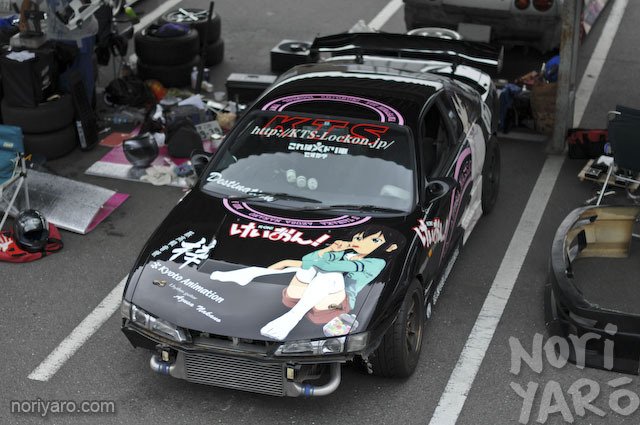 Remember yesterday’s Fairlady? 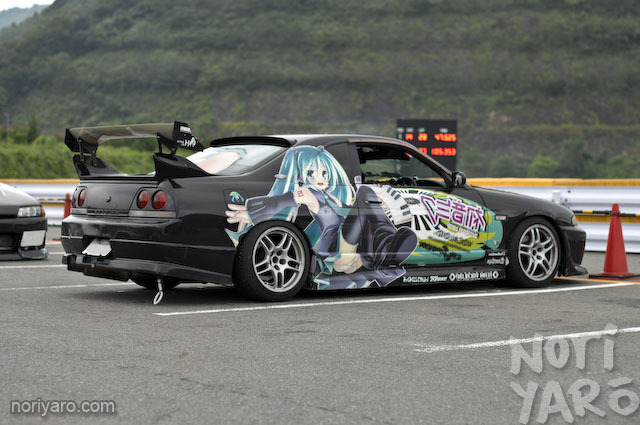 Here’s a more common depiction of Hatsune Miku. 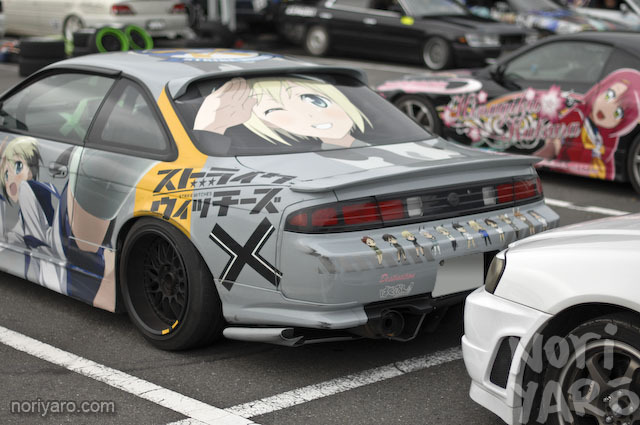 Yep, Skylines have a pretty tough looking…hang on, what’s that on the rear window? 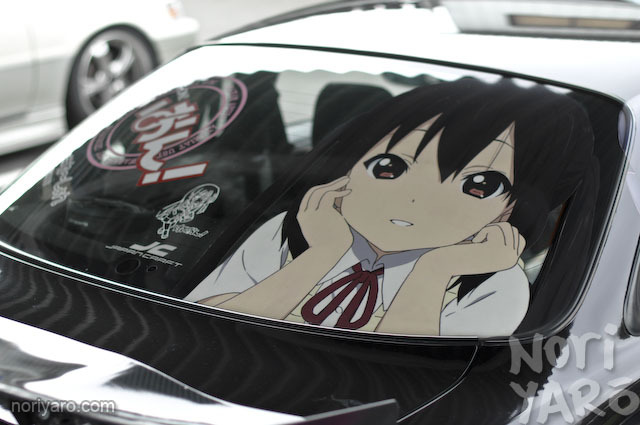 So, why not cover your car in cute girls? 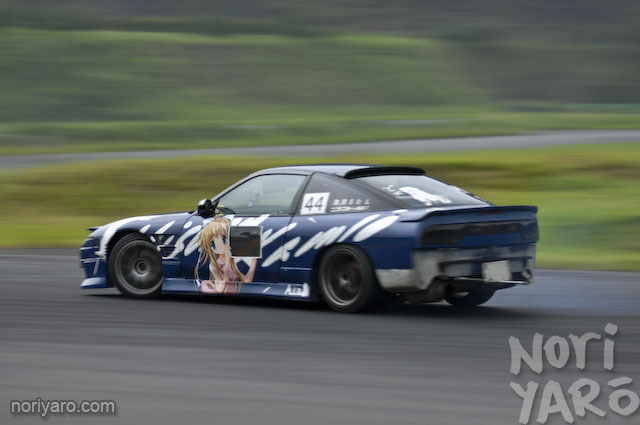 They’re a nice addition to the standard drift-car tribal patterns. They might be a bit hard to explain to your girlfriend though…if you have one. Perhaps a waifu will suffice? 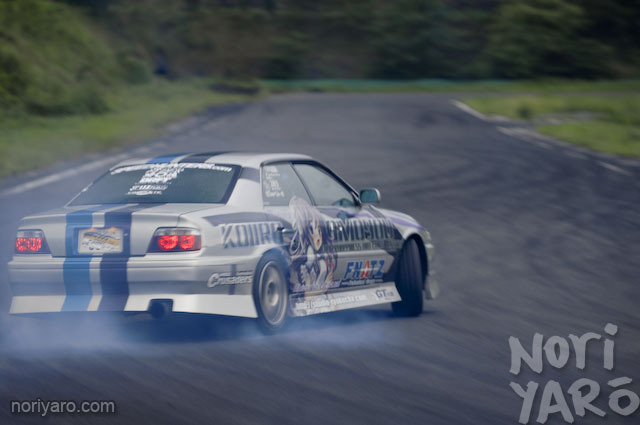 Although girls dig drifters, right? 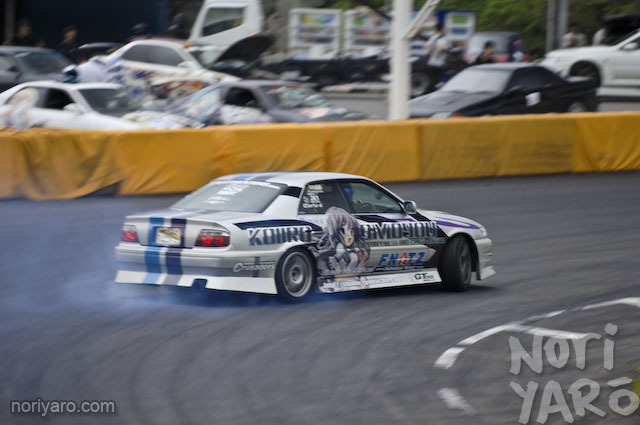 The guy in yesterday’s first picture, Ukki-san, was the best drifter at the event. He actually has a setup very similar to my Mark II, same turbo and everything. The HKS GT2835 has good response, but it’s not much good for smoke. 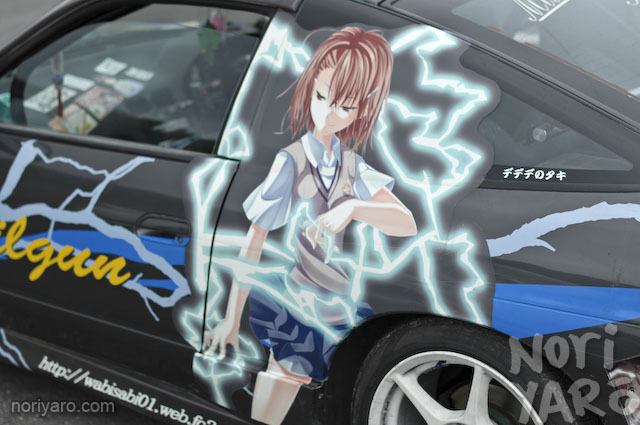 Railgun fans may have noticed that the event’s name was a parody of that series. I’m more partial to Kuroko myself. Here’s a bit of an old-school reference-nyo on this Mark II Qualis-nyo, which I might add is a Mark II only in name. 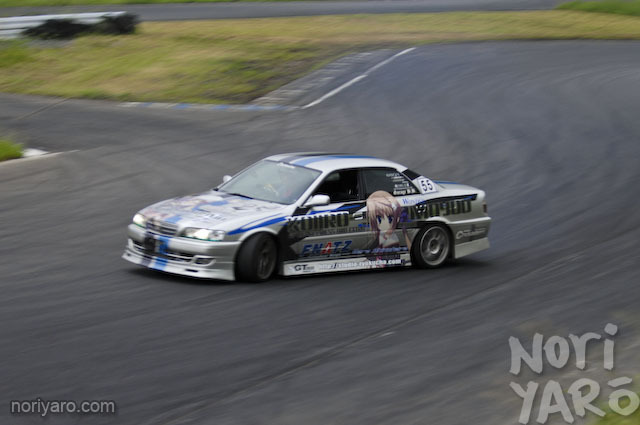 Front-wheel-drive-nyo! 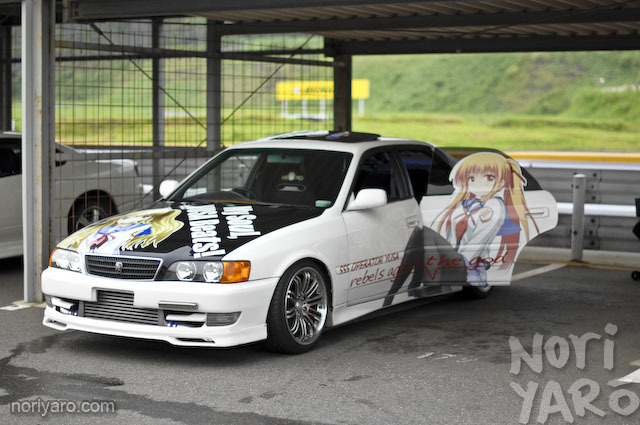 Please, it’s a damn Camry-nyo. Di Gi Charat’s Dejiko, Puchiko and Usada. 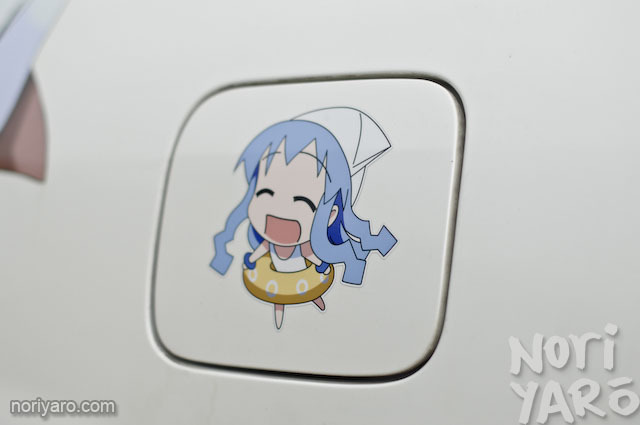 Bonus mini Ika Musume on the fuel filler door de geso. 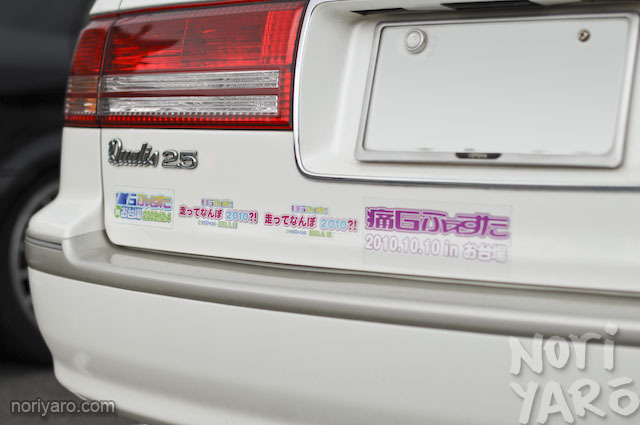 These stickers are from events organised by “Ita G”, a magazine focuses purely on itasha, itabike and itachari. 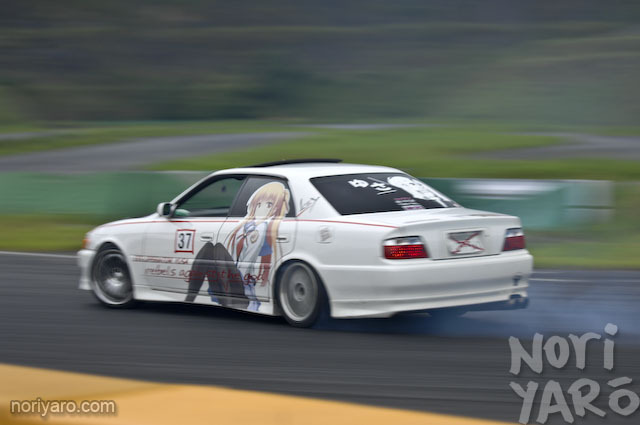 You’re right mate,only in Japan can you get away with stuff like that on what is otherwise a tough car. Here,your sexuality would be in question. There,it’s both cute and offensive at the same time. 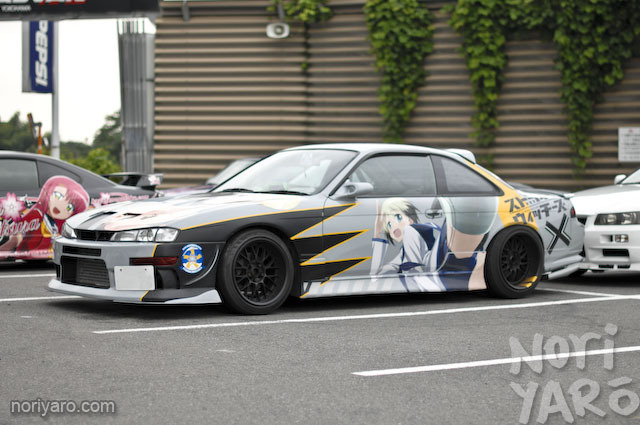 WOW, Awesome MAN, what are the rims on the first s14? 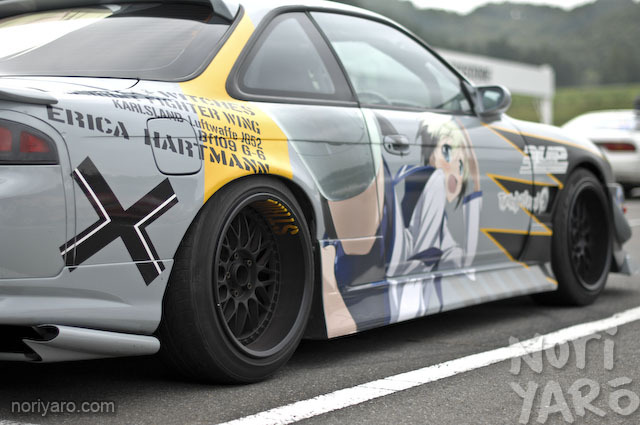 The Strike Witches S14 is so awesome! 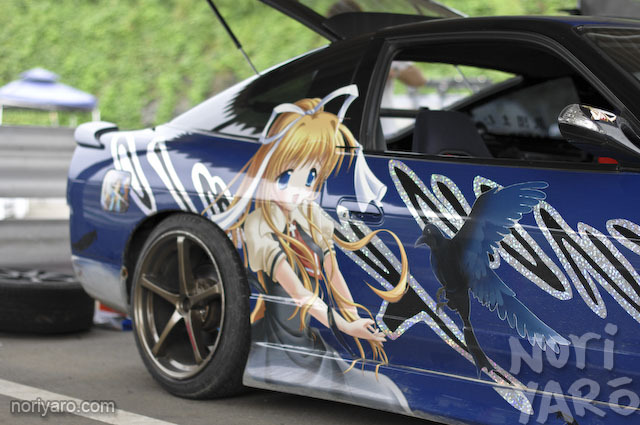 I wonder if anyone’s done an Itasha of Eila yet. 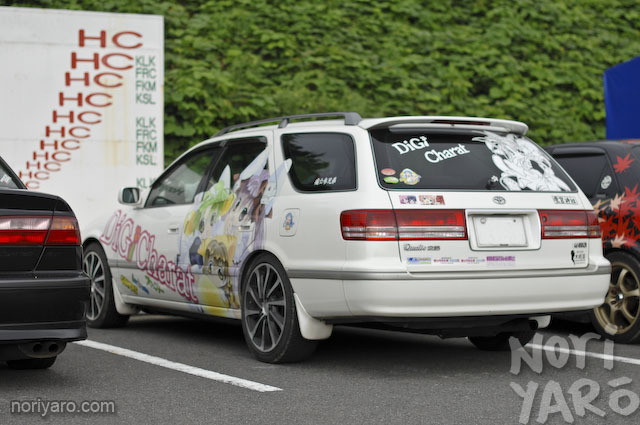 Actually people have been putting itasha on cars for years…(mostly pictures of robots, samurai’s, and other “manly things”) and lets not forget the Vanning age of the 70′s with their pimped out murals. Not to mention the lowriders who have pictures of actual women airbrushed on their cars, and covered in layers of lacquer. what makes japan unique is their tolerance. 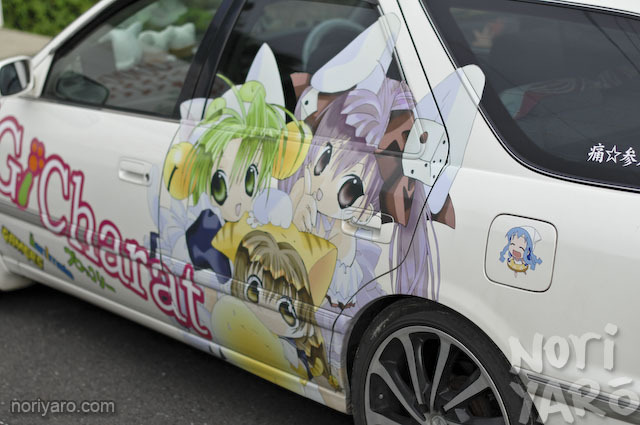 You could not get away with most of those pictures on your car…unless you wanted to be on the show “how to catch a Predator”. 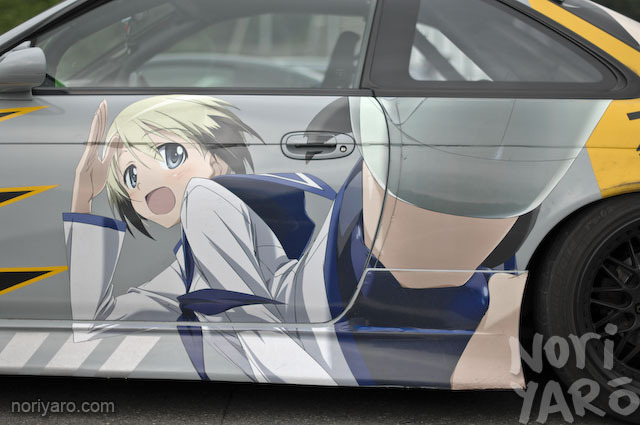 Oddly im surprised there arn’t more K-on/Gundam itasha.